Crisis pregnancy centers (CPCs) lie about abortion to dissuade women from exercising their Constitutional rights to reproductive health care. Sadly, states are complicit in this chicanery by referring women to them. A new study has documented that this nationwide campaign of disinformation extends to contraception and its relationship to sexually transmitted infections. As is often the case, these lies hurt the most vulnerable among us, those who are young, poor, and with limited education. The misinformation and disinformation dispensed by these centers is well-documented. For example, in 2006 Rep. Henry Waxman launched a Congressional investigation into their deceptive practices. The investigation documented that 20 of 23 centers studied provided false information to researchers posing as clients. Common themes include false claims about abortion increasing the risk of breast cancer, infertility, and mental health problems. Researchers at the University of North Carolina have documented in the medical literature the unethical practices of these centers. Using a "secret shopper survey" approach, researchers called or visited 32 crisis pregnancy centers across the state. More than half provided false claims about abortion. Sixteen percent asserted a link with breast cancer, 21% with infertility, and 26% with mental health problems. 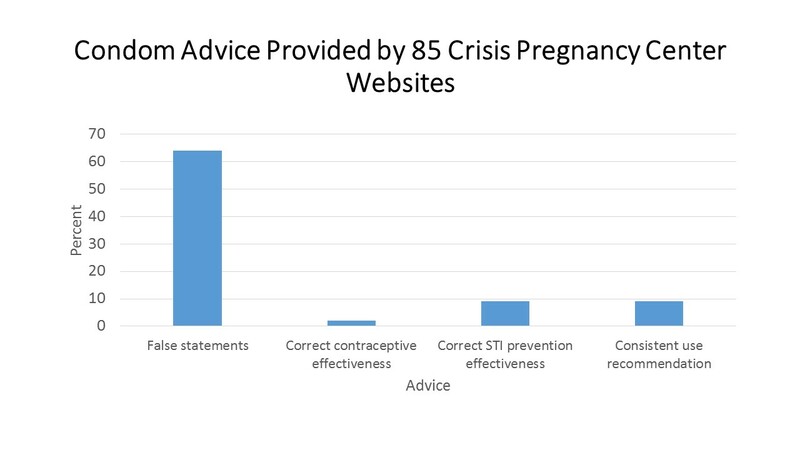 In a complementary study, these investigators examined the claims of websites sponsored by crisis pregnancy centers in 12 states. Of 254 websites examined, 80% provided one or more false or misleading medical claims. The most frequent lies included putative links between abortion and mental health risks, preterm birth, breast cancer, and future infertility. In a just-published study of these websites, researchers at UNC documented that these centers target adolescents with inaccurate information about male condoms as well. This is especially pernicious, given the heavy reliance of adolescents on the Internet for medical advice. Of the 254 websites studied, 85 provided information about condoms or sexually transmitted infections (Figure below). Most discouraged use of condoms, claiming that they frequently break or are ineffective in preventing infections. Only 2% correctly cited the contraceptive effectiveness of condoms. Only 9% correctly cited the protection against sexually transmitted infections afforded by condom use, and an equal percentage advocated correct and consistent use. In contrast, according to the Centers for Disease Control and Prevention condoms are a well-documented means of reducing the risk of sexual transmission of infections, including HIV. Thus, lies about condom effectiveness for contraception and disease prevention may indirectly increase the risk of unintended pregnancy, preventable abortion, and life-threatening viral infection. To jeopardize the health -- indeed, lives -- of adolescents to advance a political agenda is reckless and cruel. "Does not recommend, provide, or refer single women for contraceptives. (Married women seeking contraceptive information should be urged to seek counsel, along with their husbands, from their pastor and/or physician.)" Should a single woman request a referral for contraception, her request would be denied. Pragmatists might disagree with this approach. For married women, the first-mentioned source of advice about contraception is "their pastor." What training in obstetrics and gynecology is offered in divinity school these days? 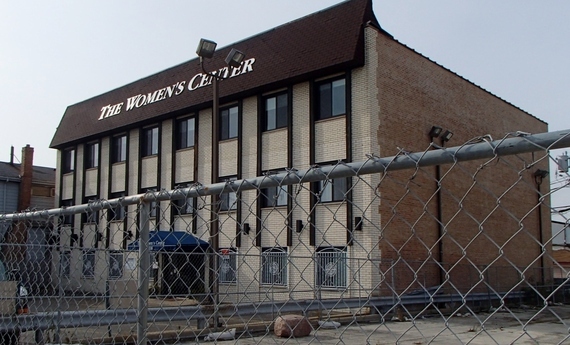 The paradox: at this center single women routinely receive counseling against abortion, but single women cannot get help avoiding an unintended pregnancy that might lead to an abortion. Three principles of bioethics provide the foundation for all health care. Beneficence holds that what providers do for women is in their best interest. Withholding critical information or providing false information clearly violates this principle. Autonomy means choosing among available health care options based on a full and accurate description of the risks, benefits, and alternatives. Disinformation about the safety and efficacy of abortion and contraception is inconsistent with this principle. Finally, justice implies equitable access to health care. 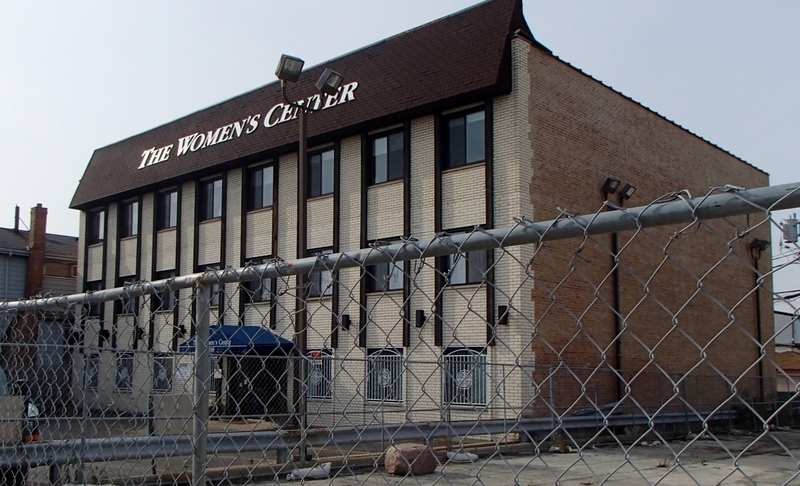 Crisis pregnancy centers disproportionately prey on those with limited education and resources. This environment does not place the woman at the center of the health care process. Instead political battles structure and replace concern for women's health. The broader literature on health and inequality teaches us that an inability to seek out credible information will likely be worse for a woman with few financial resources, or who may simply not know how to navigate this highly political health care landscape. Lying about condoms and their protection against both sexually transmitted infections and pregnancy undermines public health. If an organization must lie to promote its agenda, then something is fundamentally wrong with that agenda.